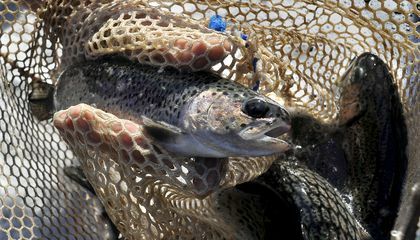 Tons of rainbow trout had to be rescued from a Central California fish hatchery. They were moved by truck to cooler lake water. The move spared them from the state's relentless drought. That's according to wildlife officials. 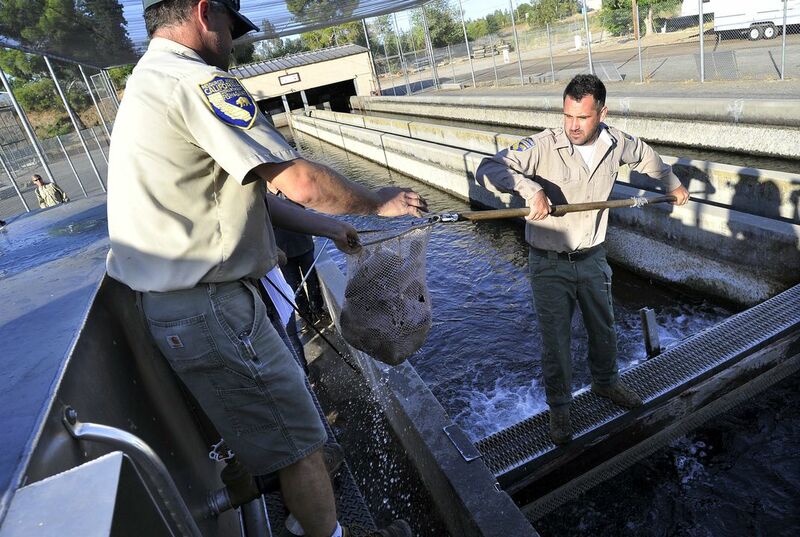 About 80,000 pounds of trout were scooped up from the San Joaquin Hatchery. It is near Fresno. They were hauled 30 miles uphill to Shaver Lake. It is in the Sierra Nevada foothills. Temperatures in Millerton Lake, which flow through into the hatchery on the San Joaquin River, had reached nearly 70 degrees. That threatened the trout's survival, The Fresno Bee reported. "The drought is having a devastating effect," California Department of Fish and Wildlife spokesman Andrew Hughan said. "We're really making an effort to save as many fish as we can and get them into cold water before it gets any warmer." The first round of trout was shipped by water tank to Shaver Lake on Aug. 12. Another 50,000 pounds of trout will be moved to surrounding lakes in Fresno and Madera counties. This marks the first evacuation of fish from the San Joaquin Hatchery because of the drought. Other California hatcheries have gone through the process two years in a row. In June, wildlife officials trucked millions of young Chinook salmon from a hatchery near Redding to the San Francisco Bay 200 miles away. The drought depleted rivers that the migratory fish normally travel to the Pacific Ocean, wildlife officials said. Wildlife officials, also in June, scooped up endangered Coho salmon and threatened steelhead trout. The fish were struggling to survive in dwindling tributaries to the Russian River in Sonoma County. I think moving the trout is a good idea because the drought is causing an impact on wildlife. The hatcheries have to make sure that their fish are taken to colder water because they cannot survive in warm water. This drought is a very serious problem in California. Humans are not only being affected, but animals and plants are being affected, too. Answer: The trout are measured by weight because maybe there is a weight limit on one truck so they have to weigh the trout. Wildlife people are moving the trout that is in the California place into another place where the water is cooler and the fish will be able to stay in that place to live a better life. They are mainly moving the fish so that they can get more fresh water and so that the fish can be out of the California drought's way. I think that the wildlife species are in a bit of trouble because of the drought. It is heating things up and some organisms like the salmon are in danger. They have to be moved to colder waters. The waters were too warm for them to live and survive upon. Luckily, the trouts are being moved to cooler waters but the drought is still going on. The number of trout is measured by weight because they may end up as food one day. The trout are measured by weight to show just how many trout are being transferred. Trout are kind of light-weight, so 50-80 thousand pounds is A LOT of trout. They are measured by weight so they know how many pounds of fish they are shipping. Trout are measured by weight because that would determine what truck they may need to be in and how many fish they can save and move because an ecosystem can only support ever so many fish. They're measured by weight because a.) there are so many of them, and b.) they end up as food. CTQ: They are measured by weight so that they know exactly how many pounds of fish they are shipping to the different lakes. Trout are measured by weight because the truck has a specific weight limit of water plus the amount of trout to be put in.